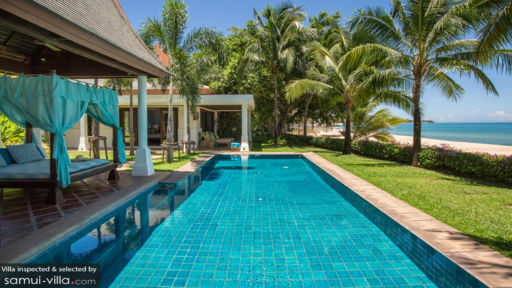 Villa Acacia is located in Mae Nam beach overlooking the Gulf of Thailand and Koh Pha Ngan. It is a stunning beachside resort which offers its guests a chance to unwind and enjoy a lavish holiday in its well-furnished and stylish interior spaces. 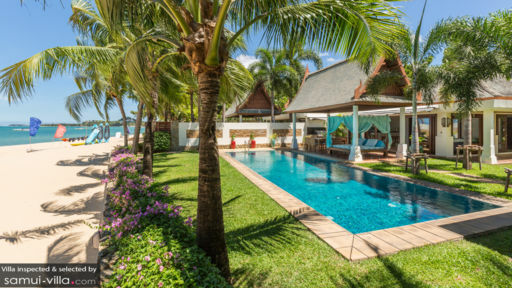 With four, air-conditioned bedrooms the villa is perfect for both friends and family traveling together as it has ample space and fun factor for one and all. The best part about the villa is the mesmerizing view of the ocean that in the distance meets the horizon, this is truly exceptional especially at sunset! The four bedrooms at Villa Acacia are furnished with quality furniture so you can have a good night’s rest and wake up without any bed sores. Two of the bedrooms are furnished with king-sized beds and the other two are furnished with single beds. Each room is air-conditioned and features wooden flooring as well as chic interiors. There are marbled en-suite bathrooms with each bedroom that boast of large shower areas and natural stone bathtubs. The 15-metre swimming pool sits under the tropical sun offering up it cool waters for guests to jump into and enjoy a refreshing swim. As the sun sets, you can relax in the pool as you observe the scenic view from right where you stand. Lounge on the sun chairs or dine alfresco-style under the traditional sala beside the pool. Verdant gardens, flush with exotic plants, trees and flowers release a sweet fragrance thus, reforming the outdoors into an enchanting and mesmerizing area where you can finally stop worrying and start living on your break! 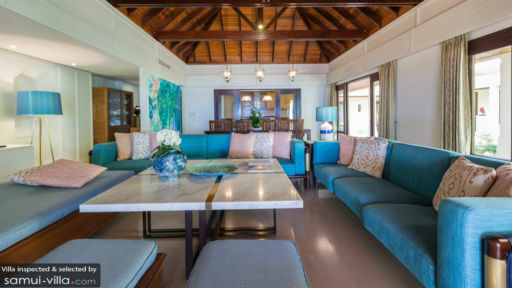 The poolside living area is designed to afford the most amount of comfort and luxury to guests with its class and elegant décor, entertainment unit, and wooden interiors. The sitting area is furnished with a comfortable sofa, several armchairs, and ottomans for additional space to sit and rest on. There are Thai accents that can be found in the décor as well, for an amalgamation of the traditional with the modern. The high-vaulted ceiling certainly creates an impactful statement, as it transports you to an otherworldly place. A multimedia room is also accessible to guests which is furnished with comfy sofas and a projector screen for the most coveted movie nights. Villa Acacia prides itself in offering the best in dining as there are both outdoor and indoor options available to guests. If you wish to dine under the stars then you can opt for alfresco, or else dine indoors as well! The kitchen is fully-equipped and ready for use, being fitted with modern appliances and all amenities. A multi-purpose gym is also there on the property for those who love to work out! From the moment you arrive to the moment you check-out, the staff will take wonderful care of you. There is the personal guest assistance to ensure that all your needs are met and other management and maintenance duties are also taken care of. A daily breakfast is served by the staff for a great start to your day! The beachside property is the best way to explore the neighboring areas as you can walk to basically anywhere. Bo Phut beach is where you will find peace and tranquility as there are fewer people here and you find some private beach time as well. Restaurants in the area include Angela’s restaurant and The Boudoir for classic French cuisine.